ORR Safety has partnered with MSA to give away a FREE MSA ALTAIR 4XR Multigas Detector every two weeks, for two months. This registration window opens Thursday, December 13th at 12:00 AM EST and closes Wednesday, December 26th at 11:50 PM EST. Fill out the form to the left to enter to win your free gas detector. The winner will receive a phone call or email and be announced on our website the Friday following the previous week's registration. Outfitted with rapid-response MSA XCell sensors, the ALTAIR 4XR Gas Detector is the toughest 4-gas monitor on the market. 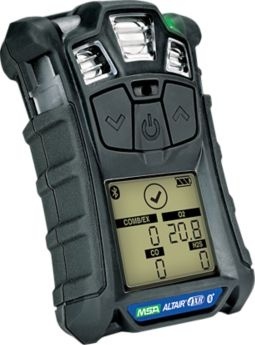 The ALTAIR 4XR can also provide real-time incident awareness to team members, supervisors, safety managers, and others when paired with the MSA ALTAIR Connect app via a Bluetooth wireless connection. Contest entry means acknowledgement that your name may be published on our site and used in social media posts. All units are covered under MSA’s standard 4-year warranty, including sensors. Units being given away are for a specific configuration only and cannot be customized. WEEK 1: Congratulations to James T. from Rhode Island! WEEK 2: Congratulations to Sarah K. from California! WEEK 3: Congratulations to Angie M. from South Carolina! Thanks to everyone who has entered so far!